It's officially fall!! Let the fall... fall on us while we prepare ourselves for the holidays and tons of food that goes along with it. I decided to go for some hot pot with my love and we absolutely love it here at Hotto Potto. It's a bit of a distance for us but when it comes to good food I'm always willing. 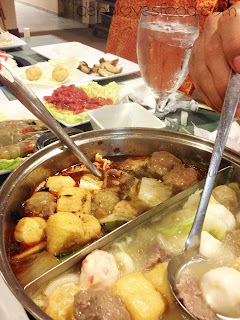 Hot Pot is a childhood dish that is always served while we have any family gathering. 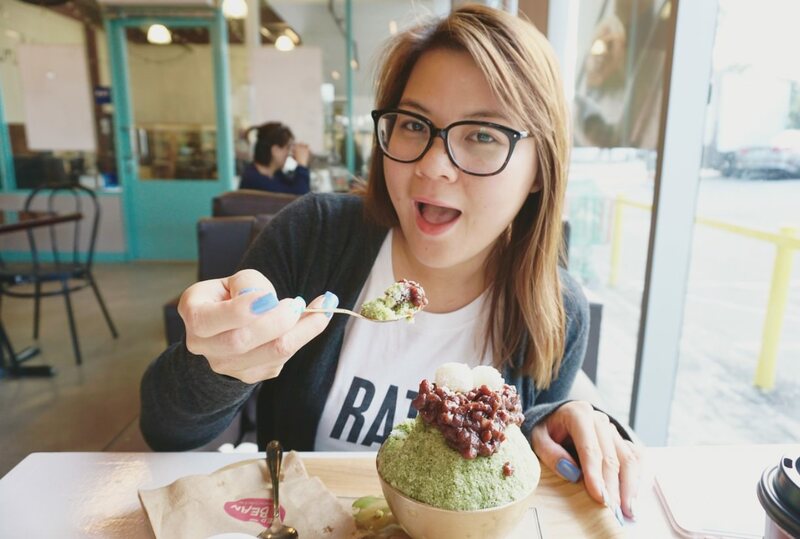 It's a very active and family style meal that's customizable according to your preference. 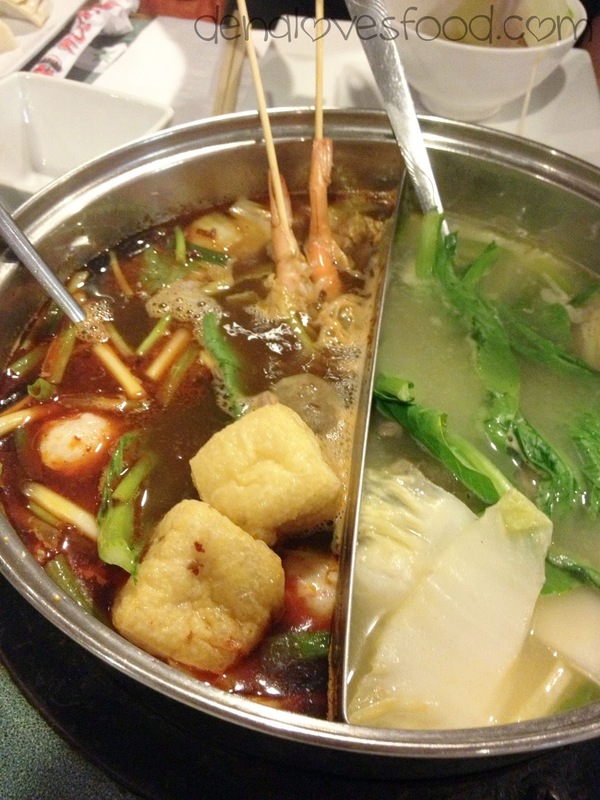 Here at Hotto Potto you have a choice of around 4 different types of broth and also customizable spice levels. 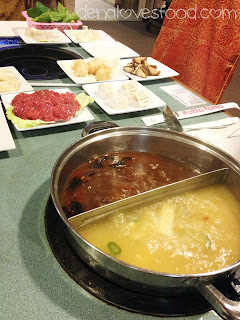 We've tried the spicy meat broth, mild meat broth and also a spicy tom yum broth. I would have to say the spicy meat broth is one of my favorite. After you've decided on the broth your next mission is to choose what you would like to be cooked within your yummy broth. I would have to say when it comes to choosing I am always going overboard (prices do add up!) but I'm able to always finish it all. Platters of little dishes comes out full of ingredients chosen for this adventurous time. Each plate could range from $1.80-$3 and more according to market price. Here's a picture of my man with this weird "kitty face" he has. Ignore that and just notice all those little plates of goodies waiting to be bathed in spicy broth! After dropping a load of food into the broth, let it cook accordingly and sit back and admire your beautiful creation. Oh and while you wait why don't you go ahead and make an amazing dipping sauce! On the side of each table there's a cart full of a dozen or more different types of sauces from vinegar, soy sauce, oyster sauce, garlic and so on. Go ahead and experiment until the perfect dipping sauce is created. I really love hot pot and am excited when I'm able to create my own food right in front of me. If you're feeling like trying something new and super customizable meal be sure to hit Hotto Potto up! I am in love with this place that I actually visited it twice within one week! Wooo that's a lot of food. OH and don't let me forget about the biggest plus on top of the delicious food. They are open super super late, weekdays til 2 or so and weekends til 5 in the freaking morning. Heck yes! !